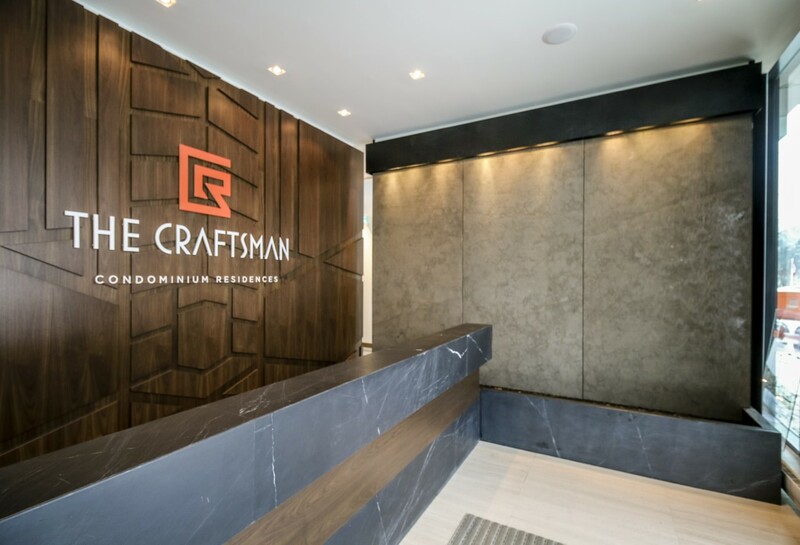 With the preview sales centre now closed, The Craftsman Condos by VANDYK Group of Companies is preparing to open the doors of their brand new presentation centre located on-site at 1601 Lake Shore Road West. 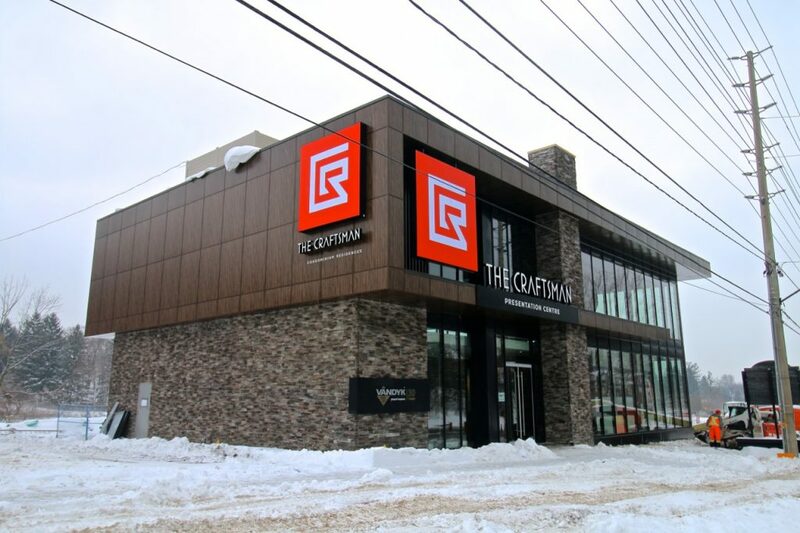 While the new sales centre is scheduled to open on Saturday February 21st, BuzzBuzzHome News dropped by this week to get a sneak peek and tour of the impressive space. Inside the large glass and stone structure, a spacious wood and marble-clad entrance greets visitors along with a grand wall-sized waterfall. 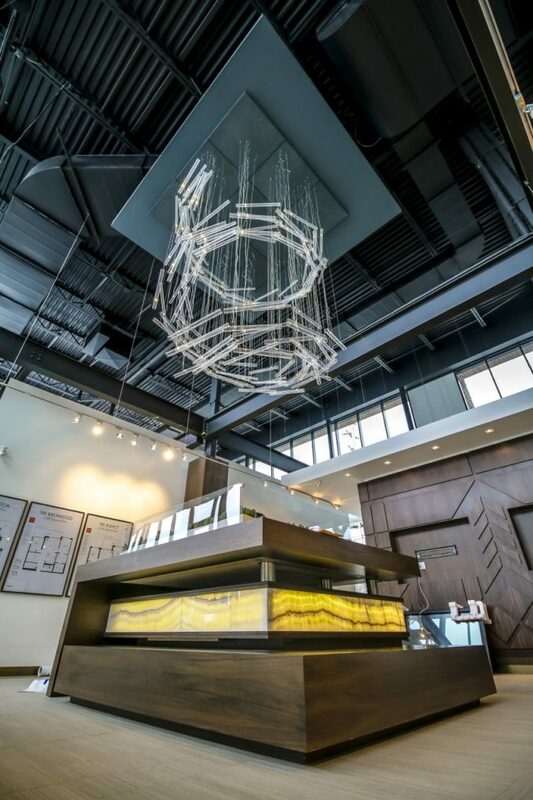 There’s even a dramatic chandelier that graces the soaring ceilings and hangs above the large scale model. 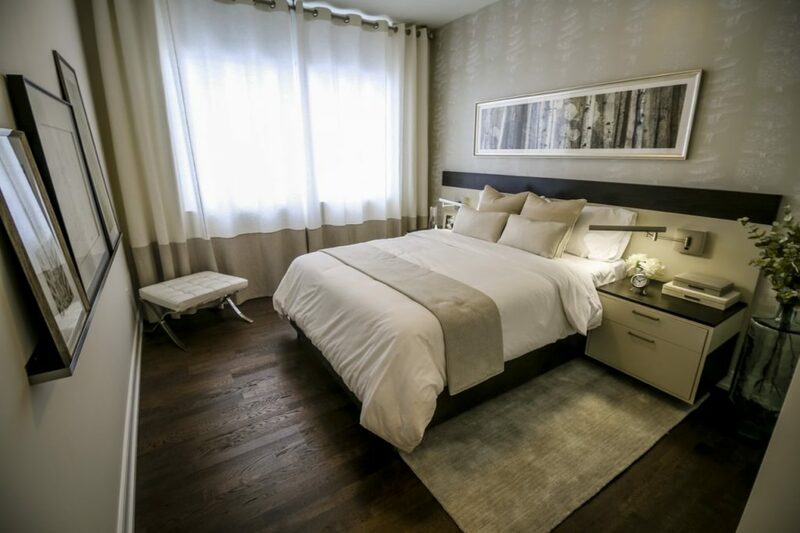 The sales centre also comes equipped with a fully-furnished and professionally-decorated model suite. It features the The Clarkson floorplan, a a two bedroom, two bathroom, 1,097 square foot corner unit featuring an oversized L-shape balcony. 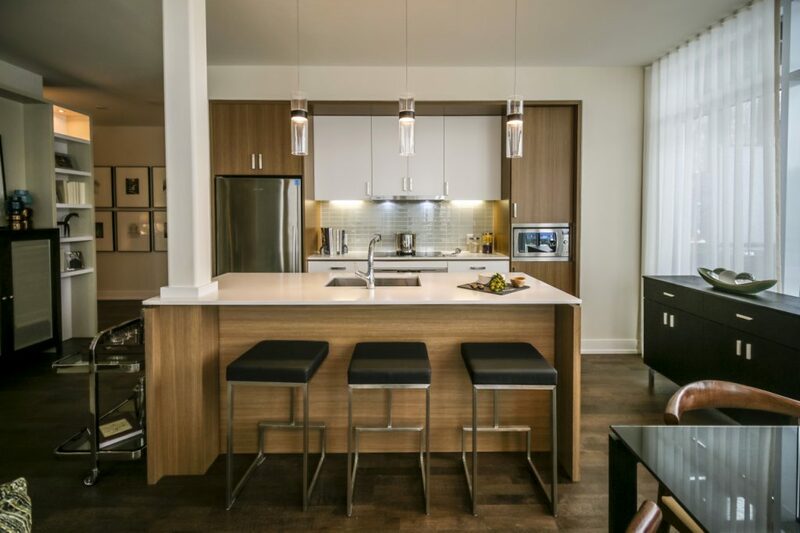 The Clarkson is also home to a gourmet kitchen with island and a luxurious master suite with a walk-in closet and an ensuite bathroom with a generously sized glass shower. The second bedroom is adjacent to the second full bathroom and can be used as a guest suite, den or home office. Like The Clarkson model, many of the suites at The Clarkson Condos are designed with the end-user in mind — buyers looking to downsize from larger single family homes. “In these designs we made sure that the living spaces are spacious enough for people who are bringing furniture such as full size dining room tables, chairs, and hutches, so they can still entertain and have family for dinner,” said Linda Mitchell Young, VP of Sales and Marketing at VANDYK. Some layouts also include powder rooms for guests, and laundry rooms with a tub and counter to fold clothes. When complete, the 300 unit development will feature a Frank Lloyd Wright-inspired exterior characterized by sweeping horizontal lines, expansive glazing, warm wood colours, and stone facades. The Arts and Crafts architectural style continues in the hotel-inspired lobby with its warm wood tones, stone fireplace, and earthy palette. Other amenities include the Clarkson Club, which houses a private dining room and catering kitchen, as well as landscaped courtyards, water features and sculptured shrubbery. 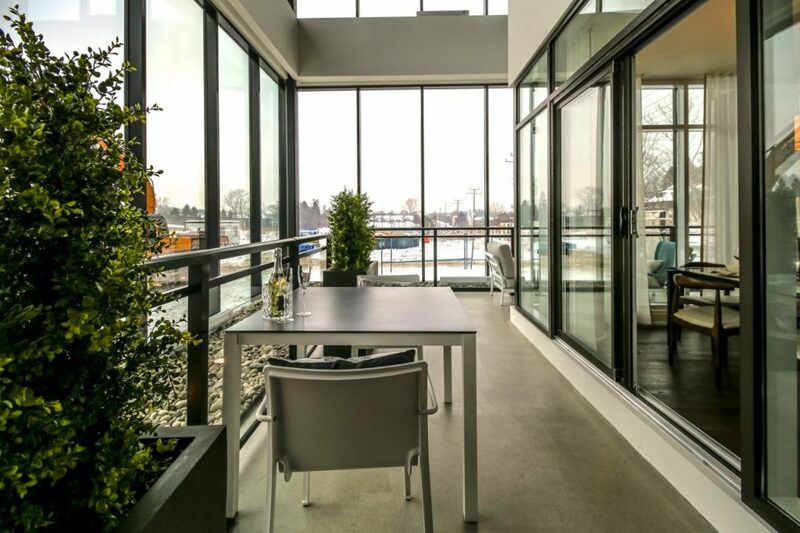 Residents at The Craftsman will also enjoy an expansive rooftop terrace overlooking Birchwood Park, complete with a trellised lounge, barbecue area, and fire pit. 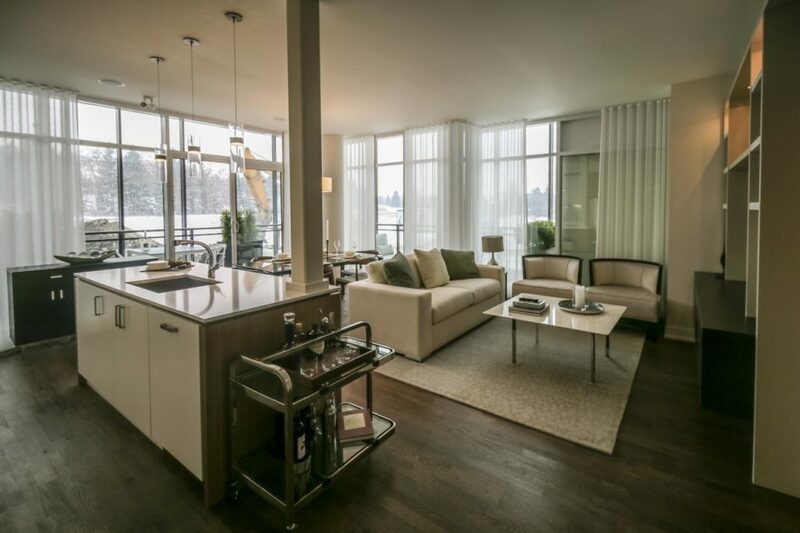 Sales at The Craftsman Condominiums start from the low $300,000s. 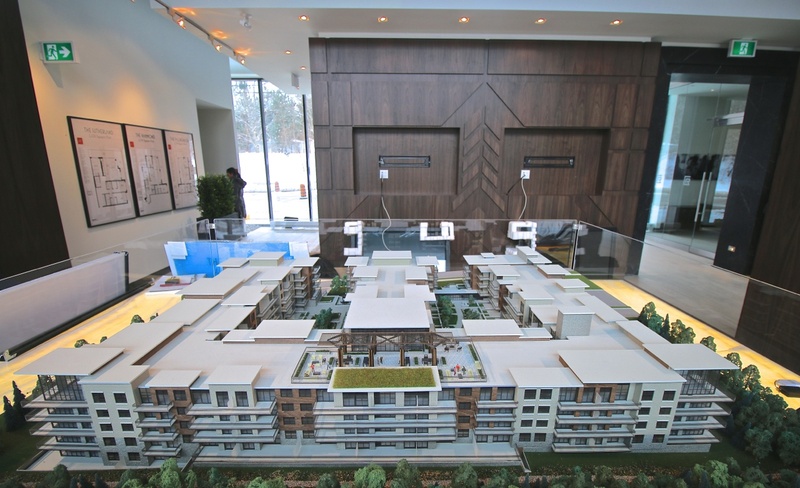 To learn more about the project, and to view the model suite for yourself, make sure to drop by the new presentation centre when it opens Saturday February 21st. 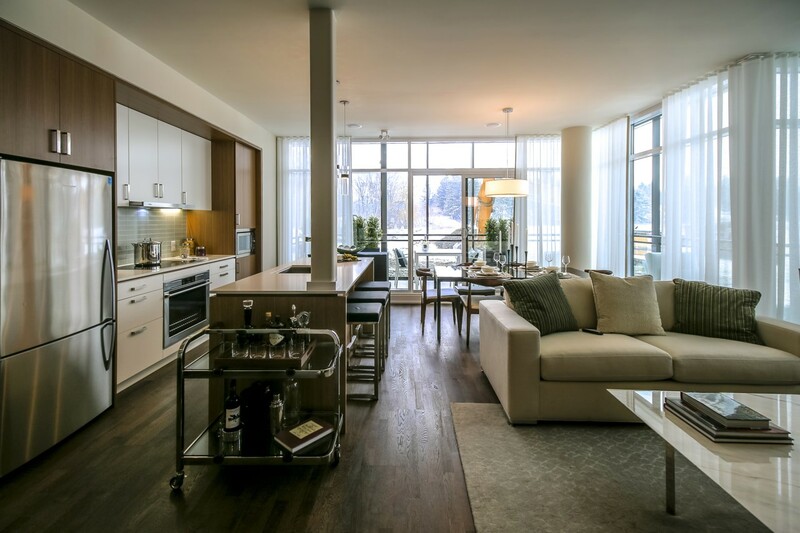 Check out more of our presentation centre and model suite photos below. For more information please call 905 823 4044 or register online.